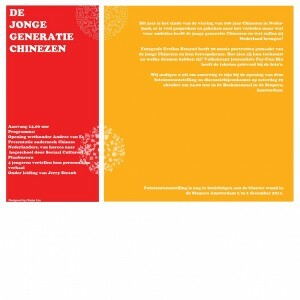 This year is the celebration of 100 years Chinese in Holland. We have seen a lot from the first and second generations Chinese in Holland now, and wondering what will the future look like with the younger Chinese generation. Therefore 20 youngsters are selected to be portrayed in this exhibition. There will be portraits about their ambition, dreams and future. It is my honor to be showcased as one of the youngsters during this exhibition and a pleasure to me working with Eveline and Pay-Uun for the interview and photo session. Stopera is literally the combination of the city hall of Amsterdam and Opera (music theater) in one building in the center of Amsterdam. The photo show will be available until 2 December 2011 in the Stopera Amsterdam. This Saturday 29th of October, 14.00 – 16.00 Andre Es (wethouder/alderman) will be opening this great event with a speech. Hope to you meet you there. Hey buddy, Where on Earth are you suppose to get IPADs for free? This is insane! 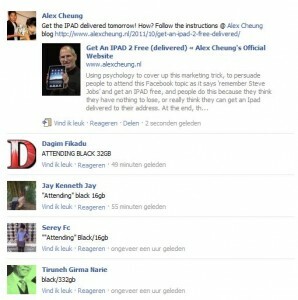 Using psychology to cover up this marketing trick, to persuade people to attend this Facebook topic of ‘remember Steve Jobs’ and get an IPAD free, and people do this because they think they have nothing to lose, or really think they can get an Ipad delivered to their address. At the end, they’re just remembering Steve Jobs and get it forwarded right? But hold on a second, where not looking for targets like Jerry the mouse right? SCAM! This shows that most people are greedy.. We’re living in an acquisitive society, and people make use of it. HA HA HA HA How ridiculous can this be! As the mouse will fall into the trap, I do believe Jerry the mouse won’t. So actually their target is to reach at least 25,000 mice each Facebook event. 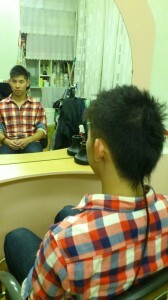 Multiply this and WOw! That is Massive isn’t it. Seeing all those participators, it just make no sense at all. it just shows even more that Apple brought her brand to another level, becoming a Lovemark to their success in Western countries. To the compromised accounts, Change your account password. This scam is on the Google Alert list. But I think it should have been in your alert list way earlier and go right to the trashcan. This is what happened in 2 days. You must follow these steps and complete them “carefully”. Step 1: Click “here” not “here“. If you skip this step, the automated system will not register you. This is very important. Step 3: Click on ‘Order now’ and choose what type/color you would like to receive. (Black/White)(16gb/32gb) remember to skip all the crossing selling items.. Step 4: Continue to the register and fill in the shipping details on where you want your iPad 2 to be DELIVERED. Now PAY your Order. Step 5: Come back to this site and leave a message whether you have received your iPad 2 or not.